Intermón Oxfam Trailwalker Until the 07/04/19. Girona is one of many places around the world where the Trailwalker takes place. Four people, 100 kilometres, 32 hours and one great cause: the fight against poverty and injustice in the world. That’s what the Trailwalker event is all about, an original physical and fund-raising challenge in the form of a race organised by the NGO Intermón Oxfam. Are you ready to pick up the gauntlet? All you have to do is sign up as part of a four-person team and complete the 100 km of the race together in less than 32 hours. Don't worry; you don't need to be an elite sportsperson to manage it. With the right physical and mental training and a good support crew, anybody can complete the race. The challenge is not just physical, of course; the teams pledge to raise funds for development, humanitarian, fair trade and awareness projects in over 40 countries. The highly efficient organisation of the race is an important factor in achieving its fund-raising purpose. You'll have detailed information on the route from the Girona Pyrenees to the Costa Brava, along with checkpoints that provide supplies and anything else you might need, such as medical services, etc. 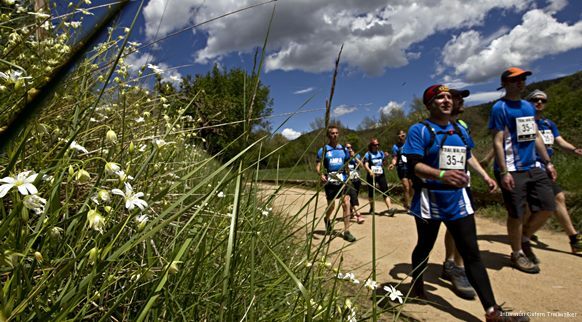 Girona is one of many places around the world where the Trailwalker takes place. Are you up for it? Choose your team, train well... and remember that the kilometres completed by your team will help to improve the lives of other people.